One expert and critic of the Big Bang, presenting the theory, asserts how widely held is this view of the origin of the cosmos by most modern cosmologists. Cosmologists nearly all agree that the cosmos came into being some ten or twenty billion years ago in an immense explosion, the Big Bang. Our mighty universe, they believe, began in a single instant as an infinitely dense and hot pointlike ball of light, smaller than the tiniest atom. In one trillion-trillionth of a second it expanded a trillion-trillionfold, creating all the space, matter, and energy that now make up the galaxies and stars. = from the book The Big Bang Never Happened, in the chapter entitled, eponymously, ‘The Big Bang Never Happened’, Chapter 1 page 11 by Eric J. Lerner, Vintage Books, 1991. Unfortunately, the Big Bang is plagued with many paradoxes and contradictions, leading, among other tactics, to its having to introduce ad hoc hypotheses regarding the wide-spread galactic distribution of such dubious existents as dark matter, dark energy, black holes and a homogeneous early universe. But now an entirely different concept of the universe has developed, although it is not yet known to many astronomers. It begins from the known fact that over 99 percent of the matter in the universe is plasma—hot, electrically conducting gases. (In ordinary gasses, electrons are stripped off by intense heat, allowing them to flow freely.) Extrapolating from the behavior of such plasma in the laboratory, plasma cosmologists envision a universe crisscrossed by vast electrical currents and powerful magnetic fields, ordered by the cosmic counterpoint of electromagnetism and gravity. — from The Big Bang Never Happened, 1991, page 14. What follows below is an overview of Plasma Cosmology, its key ideas, prime movers, and its fundamental perspectives that provide the foundations for a new theory of the emergence of cosmic phenomena underlying the universe. What is most powerful and significant about plasma, is that it is in fact a fourth form of matter (solid + heat -> liquid + heat-> gas + heat + electricity -> plasma). Plasma exhibits properties unseen in the other forms of matter. Plasma is an emergent form of matter in that it spontaneously organizes itself into a cellular, nodular, electro-chemical substance. Formed as Plasma Sheets or Double Layers. This special cellular form of electro-magnetic matter is essential to the concept of Plasma. It was first given the name plasma by the physicist, Irving Langmuir, due to its resemblance to fluid plasma in the blood stream of vertebrates (including man). Equally important as its emergent structure, is the incredible pervasiveness of plasma in the universe. It is believed to constitute over 90% of the matter in the universe. It exists as an electrical fluid filling virtual all of what was once believe to be empty space! Thus plasma gives us a remarkable new perspective on the structure and nature of the universe as well as its natural laws. For a concise overview and definitions of the key concepts and topics of Plasma Cosmology, including: The Solar Wind, Magnetospheres, Magnetotails, Birkeland currents, Current modes, Z-pinches, Doubleness, Electromagnetic force strength, Double Layers, ‘Frozen-in Magnetic Fields’, ‘Magnetic reconnection’, ‘Magnetars’, Power generation, Scaling Plasmas, Peratt Instabilities, Magnetohydrodynamics, see Plasma: Technical overview I. One may reasonably ask Why the electric nature of the universe took so long to discover? The most relevant answer is that the electric nature of the universe was originally a theoretical assumption. See for example: Hannes Alfven’s important book ‘Cosmical Electrodynamics’ , Oxford Press, 1950. In those days it was not possible to directly see (e.g., through telescoping observation) the electrical substance, plasma, filling much of the universe. That is because to see electromagnetic phonemona through telescopes required the use of long- and short-wavelength filters, in the infrared and ultraviolet ranges. The use of such filters, especially on extra-terrestrial telescopes (such and the Hubble and the COBE) revealed dramatically the pervasive presence of plasma substance throughout the observed universe. 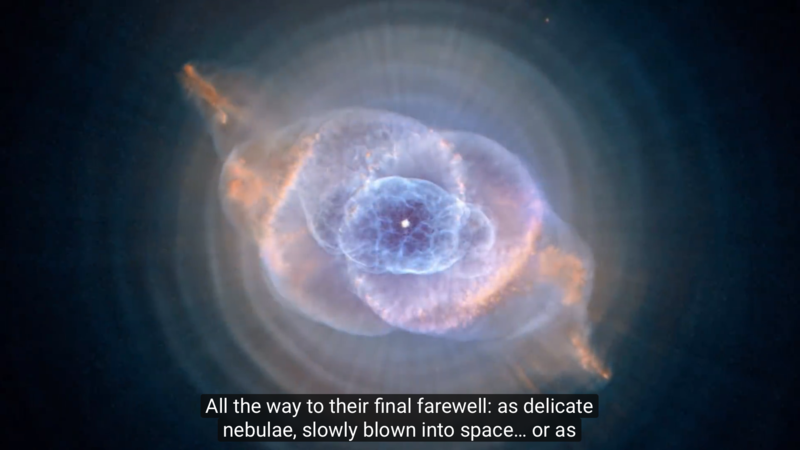 See, for example, the excellent YouTube video of the Hubble Telescope entitled ‘Hubble: Universe in Motion’, and its amazing views of the cosmos. 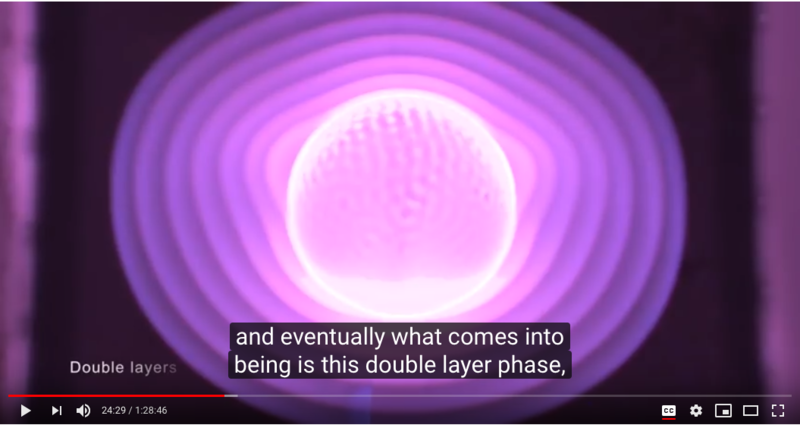 Below is a screenshot from that video, selected at time 2:40 because (although not mentioned in the video) the Hubble image captures a key concept of plasma physics: the emergence of the (nested spherical) double layer state. Today Birkeland remains highly regarded as a brilliant scientist and key founder of cosmological electromagnetism. Irving Langmuir (1881-1957), an American physicist, was the first to call this new form of matter plasma, which was inspired by the idea of human blood plasma, a fluid manifesting cellular form, where its component elements were wrapped in electrical membranes, allowing them to remain separated and not neutralize one another. Langmuir was the first non-academic to be awarded the Nobel Prize for his work in 1932. He discovered Plasma Sheathes, now called Double Layers, having observed the electrons and ions of a plasma separating during experimentation. DLs are one of the most important features of plasma behaviour.